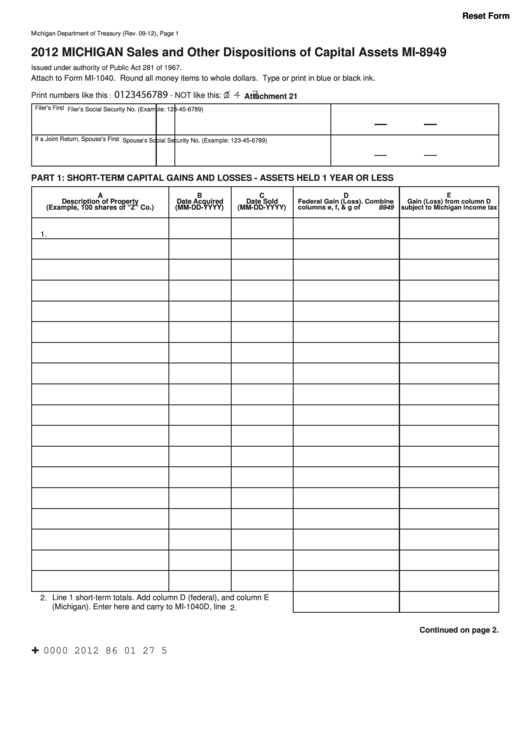 Download a blank fillable Form Mi-8949 - Michigan Sales And Other Dispositions Of Capital Assets - 2012 in PDF format just by clicking the "DOWNLOAD PDF" button. Complete Form Mi-8949 - Michigan Sales And Other Dispositions Of Capital Assets - 2012 with your personal data - all interactive fields are highlighted in places where you should type, access drop-down lists or select multiple-choice options. Issued under authority of Public Act 281 of 1967. Attach to Form MI-1040. Round all money items to whole dollars. Type or print in blue or black ink.